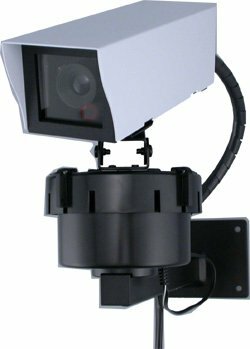 This rotating camera is ideal for homes and businesses where a stationary camera will not cover the whole area. With the remote control you can stop the camera at any point or you can choose to use the auto rotating function that allows the camera to pan back and forth continually. It connects directly to your television using the included control box so you can see and hear what's going on in any area of your home or business. With the two-way intercom you can communicate with those you see on camera. For example, you can see and speak with someone at your door before deciding whether or not it is safe to unlock it. Because the camera is waterproof, it can also be used outdoors to monitor your car, backyard, parking lot, etc. Indoors it can be used in a store to prevent shoplifting or at home to watch children and babies while they sleep or play. Simply mount the camera in the desired location and run the cable to the back of the control box which is then connected to your television set. The television set will continue to operate as normal but now when you switch to the designated channel, the camera image and sound will be seen and heard. You can also hook up a VCR to record the images and sound. This plug and play kit contains everything you need: a high resolution, rotating, color camera in metal, weatherproof housing, control box with two way intercom, remote control, a mounting bracket, power supply, and 66 ft. of cable. Measures 7 1/8 x 2 1/8 x 2 1/4" (excluding mounting bracket).